There are many power cuts lately. How do I protect my computer at home la? I've also noticed more blackouts. With the increasing number of urbanites, we might be heading into rougher times, especially in the winter months. It is a good idea to be prepared for planned - as well as unplanned - blackouts, “brownouts” (drops in voltage), surges (a sudden increase in voltage) and other power instabilities. All equipment is affected by these voltage irregularities, but in different ways. For example, a light bulb will be dimmer when there’s a “brownout” (that is where the name comes from), but the bulb itself will not be damaged. Other types of equipment can be more sensitive and more expensive to replace. IT equipment falls into this category: Computers, monitors, modems, and routers definitely need protection. Not to mention that if you are working on important documents and the power suddenly disappears, you’ve lost your work. That’s where an Uninterruptable Power Supply, or UPS, becomes indispensable. A home UPS - a small but heavy box-shaped appliance - provides stable, surge-protected, battery-backed power for your equipment. It’s simple to use: First, you connect the UPS to the wall socket. Next, you connect your computer and monitor to the UPS sockets. Normally, the UPS will use the wall electricity to power your equipment. The moment there’s a power cut, however, the UPS will start using an internal rechargeable battery to provide power to your equipment. The switch from the “wall” power to the battery power is instantaneous. As the internal battery does not last forever, you will probably want to save your files and gracefully shutdown the computer as soon as possible after a power cut starts. When that’s done, it’s time to start searching for candles and matches! When buying a UPS, make sure that its power ratings are suitable for your equipment. For example, if you want the UPS to power two 80W desktops and two 50W monitors, make sure that the “output power capacity” of the UPS is at least 260W. Also, UPS batteries have a lifetime of around 4-5 years, so check the manufacturing date carefully. 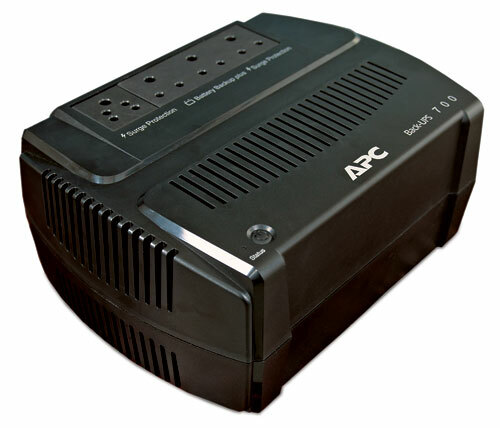 The most popular UPS brand in Bhutan is APC (www.apc.com), and their products are generally very good. The market is currently flooded with the bare-bones APC Back-UPS 1100 (660W) model. Its fan is noticeably noisy, so unless you can tolerate a very loud noise round-the-clock, I would not recommend this model for the home. On the other hand, I found the “fan-free” models - such as the APC Back-UPS ES 650VA (390W) and 700VA (420W) - to be excellent. Got an unplanned power cut? It’s time to call BPC’s toll-free complaint line (1250). The sooner BPC knows about the disruption, the sooner power will be resumed.